In this series of blog posts, I am breaking down the steps involved in resolving a typical personal injury case. Hopefully this will remove some of the “mystery” associated with the process. If you are new to this series and want to read the first post, start here. In that post, we talked about the process insurance companies use to set up and investigate claims. Some claims are settled at that stage. In this post, we’ll discuss the steps associated with filing a lawsuit, a process we call litigation. If you have not been able to settle your personal injury claim with the insurance company by this point, you have likely hired a lawyer to represent you. That lawyer may file a lawsuit on your behalf. He or she will draft up a document known as a complaint. It describes what happened, why the other side was at fault, how you were injured as a result, and the specific legal reasons you are entitled to a judgment. The complaint itself will list out the sides, also called parties, to the lawsuit. Since you are the person who filed the lawsuit, you will be known from then on as the plaintiff. The person or business responsible for your personal injuries is known as the defendant. Once the lawsuit is drafted and filed, it must be served on the defendant. This usually means that either the lawsuit was sent to the defendant by certified mail or a process server (such as a sheriff’s deputy) personally handed the lawsuit to the defendant. Assuming that the lawsuit is served on the defendant, he or she has a limited period of time to file a response known as an answer. The answer is a document in which the defendant responds to each allegation in the complaint, as well as listing any other applicable defenses. If the defendant is properly served with the lawsuit but fails to file a timely answer, the court may find the defendant in default and will treat the allegations in the complaint as if they are admitted by the defendant. If the defendant files an answer, the case moves forward into the discovery phase – which we will discuss next time. If you have suffered a personal injury because of the actions of someone else, you may be entitled to compensation. I am familiar with the litigation process, and I want to meet you. 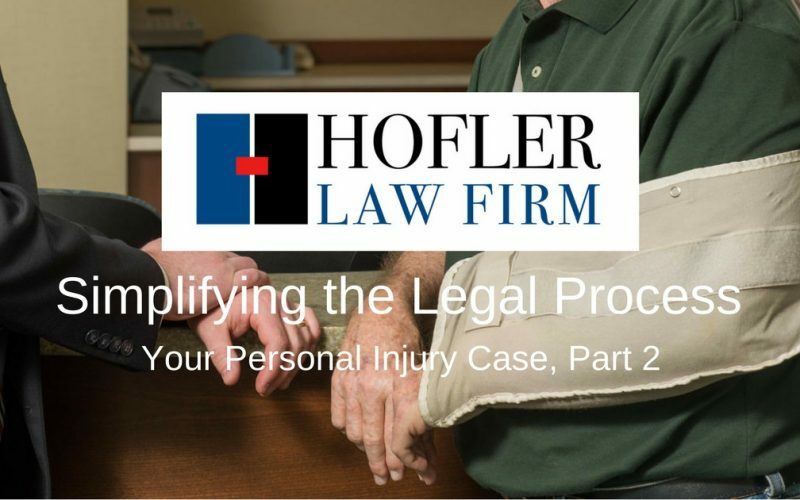 Contact Hofler Law Firm today to schedule a free consultation.